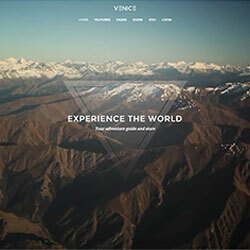 Venice Theme comes with a fullscreen position that is ideal to present images, videos or a Widgetkit Slideshow including both. The slideshow will cover the entire viewport and fit all device widths. The main navigation can be fixed to the top of the window. Additionally, you can enable an alternative navbar, placing the logo between the items of a centered menu. To match the Fullscreen Position, the navigation will adapt another style turning transparent and moving the logo above the navbar. This theme features two different blog styles. The default stacked layout with the featured image above the title and a special alternating two column grid layout. It places image and article side by side and adapts seamlessly to different device sizes. Venice utilizes Widgetkit 2 and also provides a Bonus Switcher Widget that uses thumbnails to navigate through different content panes. More features include a Socialbar widget position and different section backgrounds.